Don’t miss Mardi Gras Pop-Up Party in DFW on Saturday, February 9th, 2019 at 7 PM – 10 PM @ event1013 1013 E 15th St, Plano, Texas 75074. 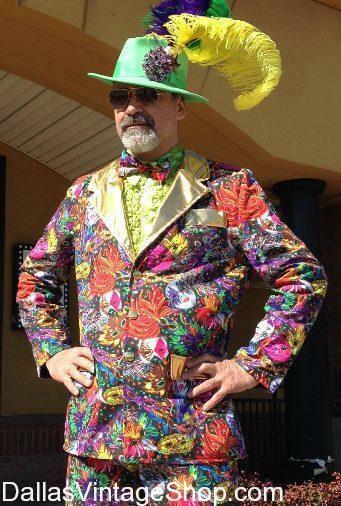 Let Dallas Vintage help you come up with Exceptionally Fun MARDI GRAS Costume Ideas. 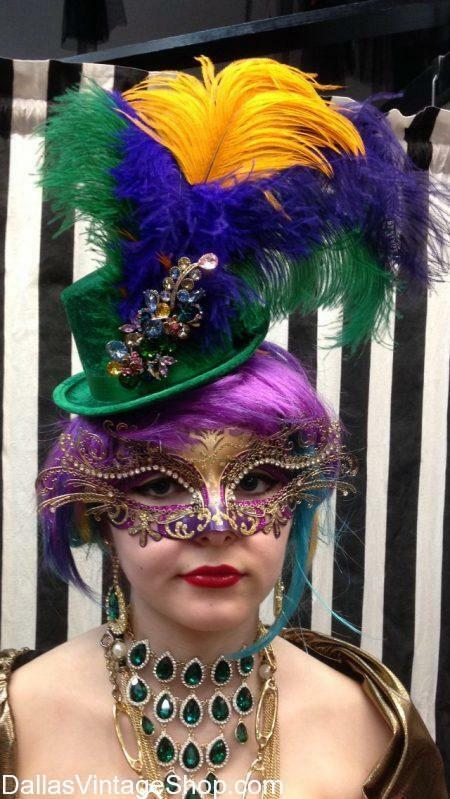 We are the Metroplex Mardi Gras Costume & Mask Superstore. Our Mardi Gras Masks are already Fabulous but we have this unbelievable collection of Brooches & Feathers to help you tweak, customize & color coordinate your mask to your outfit. Shreveport-Bossier Mardi Gras Pop-Up Party 2019 Tickets: This Event is FREE! “Catch the spirit of Mardi Gras season during the Shreveport-Bossier Mardi Gras Pop-Up Party at event1013 in downtown Plano, Texas, 7-10 p.m., Saturday, Feb. 9! This free party will celebrate the Carnival season in Shreveport-Bossier with live dance music by Tipsey, free gumbo from Chef Henry Griffin of Shreveport’s Creole Cafe’ & Catering, a king cake tasting featuring king cakes from three of Shreveport-Bossier’s top bakeries, Mardi Gras beads, door prizes, a cash bar, and more. One lucky party attendee will win the Mardi Gras experience of a lifetime – the opportunity to ride on a float during the enormous Krewe of Highland Parade XXIV on Sunday, March 3! The Shreveport-Bossier Mardi Gras Pop-Up Party is presented by the Shreveport-Bossier Convention and Tourist Bureau in partnership with event1013 and Historic Downtown Plano. The purpose of the party is to give Louisiana’s neighbors in Texas a fun, free taste of Carnival season in Shreveport-Bossier. Shreveport-Bossier’s biggest parade weekends are Feb. 22-24 and March 1-3, but Mardi Gras parties, parades, and events are already well underway. To plan your visit to Mardi Gras in Shreveport-Bossier, visit www.ShreveportMardiGras.com or call 800-551-8682 to request a free copy of The Gris Gris Guide to Mardi Gras in Shreveport-Bossier by mail. We love this Plano event. Find details on Shreveport-Bossier Mardi Gras Pop-Up Party. Saturday, February 9th, 2019 at 7 PM – 10 PM @ event1013 1013 E 15th St, Plano, Texas 75074. Prepare yourself to find an Enormous Selection of Handsome Mardi Gras Formal Attire & Masquerade Masks for the Gentlemen and Astonishingly Studly Dallas Mardi Gras Masks to compliment any Outfit. We are the Gentlemen’s Gala Attire & Masquerade Mask Headquarters for the Dallas Area. We have Ladies Mardi Gras Gala Attire and Devastatingly Gorgeous Ladies Masks too. Everything for her & him all in one place. 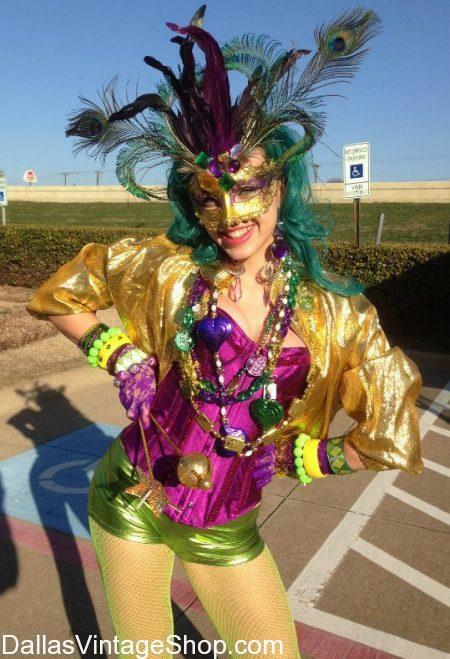 DFW events: Mardi Gras Pop-Up Party 2019, Saturday, February 9th, 2019 at 7 PM – 10 PM @ event1013 1013 E 15th St, Plano, Texas 75074. Dallas Vintage Shop is All In When it comes to Mardi Gras Formal Attire & Masquerade Masks. Our Super Selection of In Stock Formal Attire & Mardi Gras Masks for Men & Ladies DFW is ready for you. You are in 2020 TBA (Q1) Shreveport-Bossier Mardi Gras Pop-Up Party category.